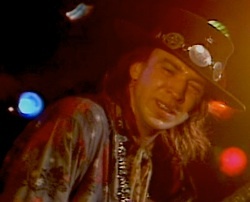 There’s no shortage of biographical information about Stevie Ray Vaughan available online, so I’m not going to write about that here. What I will write about instead is what role Stevie’s music played in my life, why I ended up playing the way I do, and why this site exists. Nobody talked about depression when I was young. I didn’t know what it was, it didn’t even occur to me that my ‘moodiness’ that people talked about, might be something that could be treated. I just remember feeling overwhelmed, and even when there was cause for some sadness, the level at which I was affected was incredibly deep and paralyzing. I didn’t know that what I was going through could be expressed by music, because I didn’t know that there was anything wrong. All I knew was that it hurt, bad. I heard Stevie’s music right before my first year of college. The album was ‘The Sky Is Cryin’, and the song was the same. I was working at Clair Brother’s Audio in Lititz, PA a the time, in the speaker department, building these huge speakers for some U2 tour or something. We had a serious sound system there for testing the speakers, and the album was cranked. I remember clear as day telling a co-worker: ‘Now THAT, is how I want to play guitar’. Fast forward a few months. I had already seen Stevie on SNL playing ‘Say What’. I had already been transfixed as I watched him destroy that stage with his guitar and wah-wah pedal. I had already caught the bug. But I still didn’t know why. Then one day while visiting my parents on break from college, I rented ‘Live at El Mocambo’. I watched with some interest until he got to Texas Flood. Again, I was glued to my seat. I couldn’t move. In the words of Neo from the Matrix, I felt ‘Something’s different’. As Stevie ripped into the solo, he starts off with his trademark bend, the Albert King influence coming through strong, and as he begins the response to the first bend, he starts bending that big fat 12 gauge string up, up, till you think your soul is going to start bleeding. As the camera looks down the neck towards his hands, Stevie leans front, turns his face to the camera and I saw something that changed my life. At 29 minutes and 36 seconds into that DVD, my life made sense in a way I had never experienced before. I saw a reflection of emotions I couldn’t express, right there, on Stevie’s face. If you could paint a picture of what I felt like all those times I was so angry, frustrated, and feeling like my world was caving in, it would look like Stevie in that moment, bending that string, giving it everything he had. Playing guitar didn’t fix my depression. But it gave me an outlet. I finally had a way to express that hurt and anger. That is why I cringe every time I hear someone criticize a young kid for trying to sound like Stevie. That kid might be doing it for the same reasons I did, and anyone that criticizes him for it doesn’t know what damage they’re doing. Some people learn to play like Stevie because they are amazed by his skill. I learned because I had to.